Oh Krishna! Sing a song like sweetness of nectar (amrit) flows. Oh Mukunda! Talk with me till my heart satisfies. Fill it into Your Divine Flute and hand us as a song. I just came back from an exhilarating experience. Divine Baba allowed me to step through the Door to Heaven. Today, is a Hindu holy day called Ekadasi, it is a time of worship and veneration of Lord Vishnu, the aspect of God involved with preservation, protection and maintenance of the universe. Lord Vishnu is part of the Hindu trinity of Lord Brahma and Lord Shiva. Lord Krishna is also an incarnation of Lord Vishnu. Last night, my dear friend Veena informed me that there was going to be a big Vishnu puja for Ekadasi at the Manav Hindu Mandir in Suntree, FL. I was about to take a nice relaxing bath and really had no intentions of going out the next day. I listened as she explained the significance of the puja and the holy day of Ekadasi. She sounded so enthused and ebullient, I began to feel slightly persuaded. Then she revealed something that really caught my ear and interest. She said that during this Vishnu celebration there is a door that the people can go through and enter into the Presence of God or Heaven. That alone was a tempting invitation. But there was something more. After reading this sublime passage, I recall saying to divine Baba: "Swami I want to go through that door!" So, when Veena offered this invitation I knew unequivocally it was from our beloved Bhagavan. The next day, I dressed up in a Bengali silk purple sari skirt set with gold trim. I wanted to look beautiful for our Lord Sai. I reflected on the sanctified words gleaned from Sadhana the Inward Path. "Swami," I prayed softly, "help me to keep my heart pure, free from jealousy, hatred, anger, lust, greed, pride. Saturate my heart with selfless love, peace, truth, right actions and nonviolence." As I drove towards the Hindu Temple I listened to Swami croon His love melodies in Telugu. It was a crisp, cold Sunday morning. The temperature had dropped considerably and the wind felt like a New York hawk. As the temple came into view I felt a golden warmth suffusing my consciousness. Hurrying into the mandir I greeted Veena and our other Sai friend Yolanda. I also saw many other Sai family members. Soon the puja began. The priest was a jovial, South Indian man who exuded a sweetness that touched us all. He bathed and washed the idols of Vishnu, Lakshmi and Bhumi Devi (Lord Vishnu's consorts). Veena helpfully explained some of the ritualistic procedures. After the adoration of Vishnu, the whole congregation began chanting the Vishnu Sahasranamam, 1008 Names of Lord Vishnu. I drifted in and out, the energy was so intense and concentrated, hallowed visions filled my field of consciousness. I saw large shadowy forms crowding the temple, as the visions crystallized hands pouring and distributing divine nectar were apparent. At one point, I saw Lord Krishna blowing His blessed conch. And, shortly after that, Swami's car entered with garlands strewn across it. I was truly in an altered state, feeling quite frankly, out of my body. As we all stood, the priest told us to form a procession. A devotee offered us sandalwood paste, which I applied to my third eye. We filed out the main door of the temple, trekking along the outer perimeter, we crossed over to another door. The priest and his attendants had adorned a large wooden door with I think the idols of Lord Rama, Sita and Hanuman on top (not sure about that). Flowers festooned this portal. Everyone became very excited as he announced this was the Vaikunta Dwara, the Doorway to Heaven. I suddenly felt a flood of overwhelming compassion for everyone huddled there at that door. I thought of the many lifetimes and rebirths we all have been through waiting to go through that celestial doorway forever. One devotee exclaimed: "We are all going to heaven," I replied, "I'm ready." 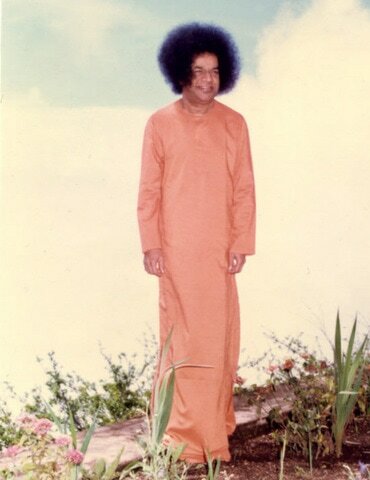 Then looming large in my field of consciousness I saw Sri Sathya Sai Baba, His curly mane blowing in the wind. He was draped in orange robes in a kind of desert setting (see picture above). One by one, we entered the Gateway to Heaven into the Divine Presence. The priest waited for us with a golden cone which he placed on our heads as we passed through. Another devotee blessed us with fruit prasadam. I am still high and in bliss from the events of this amazing day. Thank You Swami, I LOVE YOU!